Wow. If you showed me, without context, the above image it'd be hard to tell that's not an actual photo of legendary comedy duo Laurel and Hardy. That's how much John C. Reilly and Steve Coogan resemble the legendary pair in Jon S. Baird's film, Stan & Ollie, which is about to make its premiere surprisingly soon. 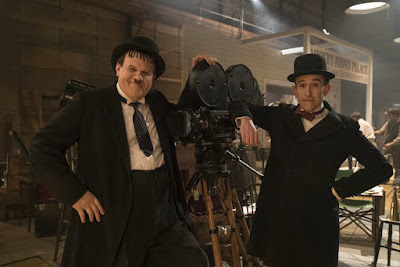 Obviously, the film is about Stan Laurel and Oliver Hardy, but this isn't a straight biopic about the height of their popularity. Instead, the film takes place in 1952 at the tail end of their careers, making one last tour in Britain. Baird is probably best known for directing James McAvoy in the R-rated 2013 film, Filth, while the script is by Philomena writer, Jeff Pope. “I’m really proud to be able to give the film its World Premiere in London; a city that’s so dear to myself and I know was to Stan Laurel and Oliver Hardy. ‘Stan & Ollie,’ at its heart, is a love story between old friends, who just happen to be two of the most iconic comedic characters in Hollywood’s history. I’m really excited to have the Closing Night film and to bring the movie to a Festival audience."